There was once a time when I collected books. I picked up books for cheap at library sales all the time and there was something about having a ton of books that appealed to me, whether or not I ever read them. Fast forward many years and children later, I found myself drowning in possessions that I did not have room for. Our living situation was unstable for years and most of my books were packed up and stored in various locations. I pretty much forgot I owned half the books I did, and obviously did not miss them very much. 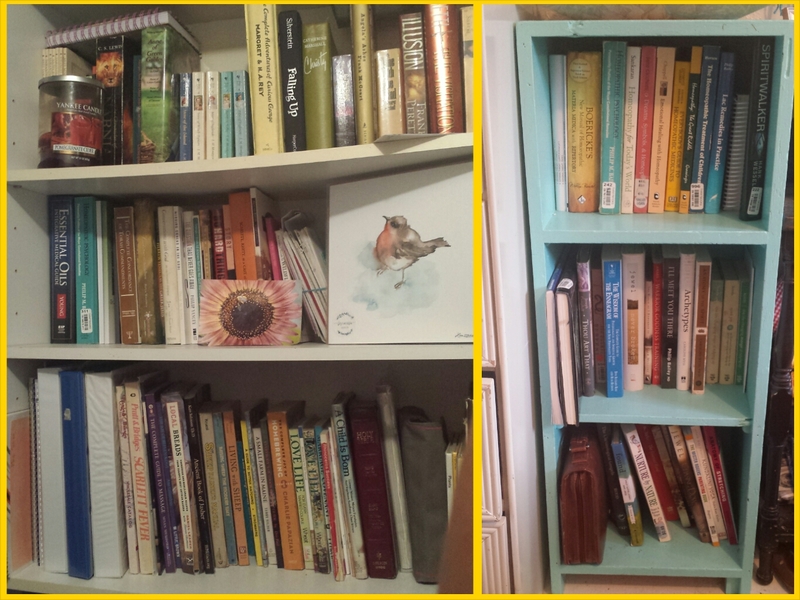 When I started the KonMari tidying process, I was eager to finally gather all my books together and go through them. I looked everywhere all over my in-laws’ property locating every single box of my books I could find. I was amazed at what I found. Over and over again I blurted out, “I forgot I had this book!” And usually it was met with the realization that I honestly didn’t care if I never saw it again. 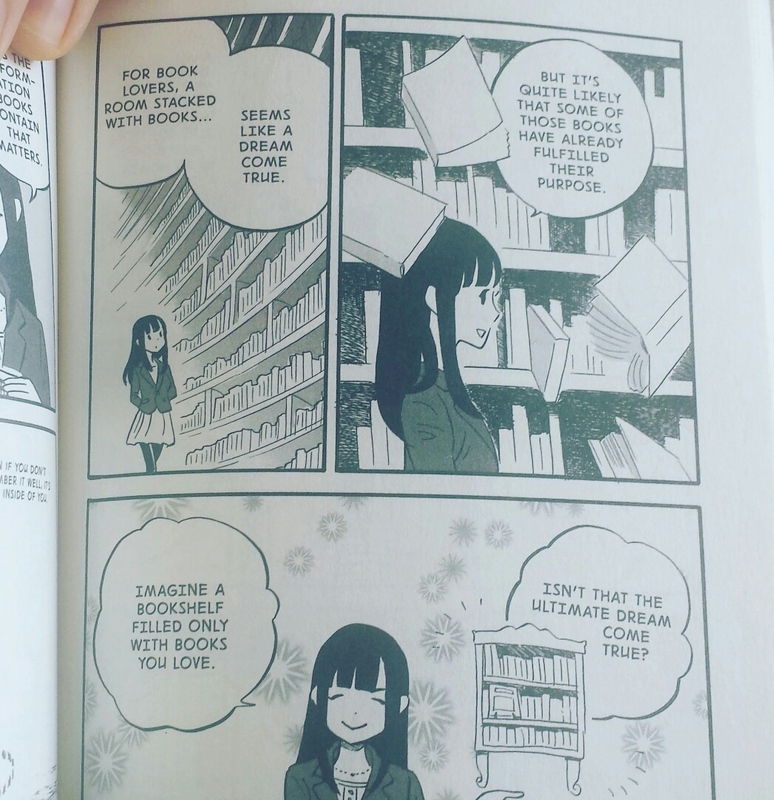 I loved this page in Marie Kondo’s The Life-Changing Manga of Tidying Up (see image above). It really connected with me: a personal library crammed with books isn’t the ultimate fantasy- a bookshelf filled ONLY with books I absolutely love is the real joy! Books are a category that you have to be really practical about. They take up a lot of space and do not get used frequently. So many books can be obtained through a local library or their informational content can easily be found online. Unless you are going to refer to a book on a somewhat frequent basis or you just absolutely love it, there’s little point in keeping it and letting it take up valuable space collecting dust. As an adult, I’ve become primarily a non-fiction reader. Although I owned many novels that I loved as a teenager, I realized the chances of me reading them again was incredibly slim. I figured if I really wanted to read them again, I could most likely find them in a library! I don’t need to store these books for an indefinite period of time. The fiction books I have decided to keep are my favorites that truly bring me joy simply by holding them. Now and then I get an itch to re-read them and enjoy reliving the stories again. I was pretty ruthless in discarding books. In the end, I discarded about 80% of what I owned. I’m now amazed to witness that ALL of my books are now contained on one bookshelf in the hallway and one small bookshelf in the bedroom (and the kids have a tiny little bookshelf in their room with their books). They are books that I refer to frequently, have greatly impacted my life, or simply bring me great joy. It’s a beautiful thing to know that every book I own is a personal treasure, instead of being yet one more book in a random collection. Marie Kondo talks about how when you finish discarding books and look at what’s left, you can discover more about your personality than you previously realized. You may reawaken old desires and pick up old hobbies that you put aside for years. When I looked at what was left, I was delighted to reconnect with some of my youthful imagination and creativity, but also discovered the specific areas of the healing arts that I’m most drawn to. The entire process has helped me tune more into who I am and what I wish to do with my life. For all book-lovers out there, I highly recommend using KonMari’s Spark Joy method to help you have a more healthy, purposeful, and joyful relationship with your books, because they truly do impact your life. What do your books say about your life? Keep and cherish the ones which help you live the life you most desire. Fun fact: I used to work in a library, and I LOVED it!